Mazda5 fills a unique space between full-size "mom-mobile" minivans, which may be too large for some consumers, and small station wagons that may not offer enough capacity. It falls right in the middle and is just right for parents who desire everyday utility, family-friendly features and a fun-to-drive Mazda performance that outshines that of your average large van or SUV. For budget-conscious shoppers, it's also a great value, offering several features and conveniences for a low price. The 2014 Mazda5 is on sale in Springfield, MO and we invite you and your family to visit Reliable for a test drive. With three rows it can seat up to six passengers with ease and delivers comfort for all with amenities such as automatic climate control, rear vents and fan controls, full power accessories, second-row under-seat storage, a fold-out tray with basket, theater-style rear seating and other niceties. Additionally, depending on the selected model (Sport, Touring and Grand Touring), the Mazda5 offers cabin features such as Bluetooth audio streaming, hands-free phone, a USB port, trip computer and more. Under the hood, every model comes equipped with a 2.5L four-cylinder that delivers Mazda's signature zoom-zoom performance. Edmunds.com's last Mazda5 review stated that its "sporty suspension and precise steering" offer a car-like performance, while its compact size makes it easy to "maneuver through tight spaces and slot into compact parking spots." The same is true of the 2014 model, which continues to deliver a fun yet efficient 28-mpg highway performance when outfitted with the manual transmission; an automatic is also available on select models. A family carrier wouldn't be complete without advanced safety features and the Mazda5 also shines in this area. Along with the usual list of safety equipment, Mazda5 is built with features like a "crushable" brake and accelerator pedal assembly, as well as a "Triple H" body structure that offers advanced collision-impact distribution for optimal protection. Learn more about this award-winning minivan and see video of its exterior and cabin in the remainder of Reliable's 2014 Mazda5 review below. 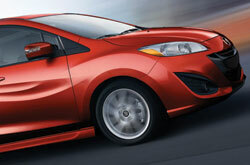 The 2014 Dodge Journey, Ford Escape and the Toyota Sienna are no match for the 2014 Mazda5! 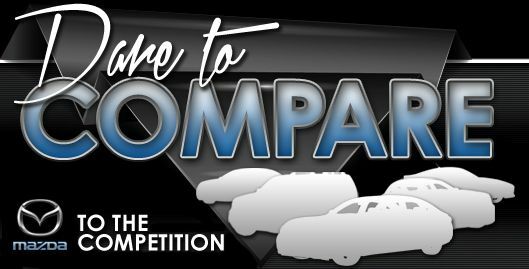 Just compare Mazda's most current model side-by-side with them and you'll find out that it beats out the competition easily. The Mazda5's handsome exterior design, cutting-edge cabin features and budget-friendly cost are sure to win over MO shoppers. Hundreds of Springfield Mazda drivers choose it because it's a truly amazing value; just compare its price to the vehicles in its segment. Check out our Quick List underneath this text for more details about its vehicle specs! 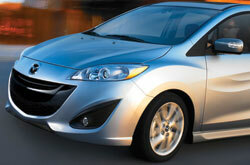 Thank you for selecting Reliable Mazda as your source for 2014 Mazda Mazda5 reviews. Stop worrying about your next purchase; look to the reputable Mazda5 dealership in Springfield for well-researched reviews recorded by automotive enthusiasts. 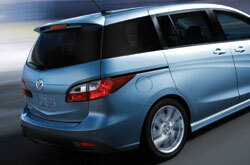 This Mazda review contains credible information about the Mazda5 and it's specifications, safety features and more. Thank you for reading through Reliable Mazda's 2014 Mazda5 review. Now that you know more about the Mazda5, pick up the phone and call us to learn about great short-term lease offers and OEM specials that can help you save substantially on your purchase.